You think, We create ! 큐로는 2004년 1월 이후 "You think, we create" 이라는 경영철학에 기반을 두고 고객을 위한 가치창조를 추구해 왔습니다. 현재 큐로는 패션사업, 솔루션사업 및 커피사업 등 캐쉬카우 사업을 기반으로 하여 세계 최초 HIV/AIDS백신을 개발하고 있는 바이오사업 및 전기자동차사업을 추진하고 있으며 영화, 드라마, 매니지먼트, 게임 등의 엔터테인먼트사업을 신규사업으로 영위하고 있습니다. 이러한 사업들은 ＂인류의 행복을 추구하는 Creative Global Family＂ 라는 큐로그룹의 비전하에 추진되고 있습니다. 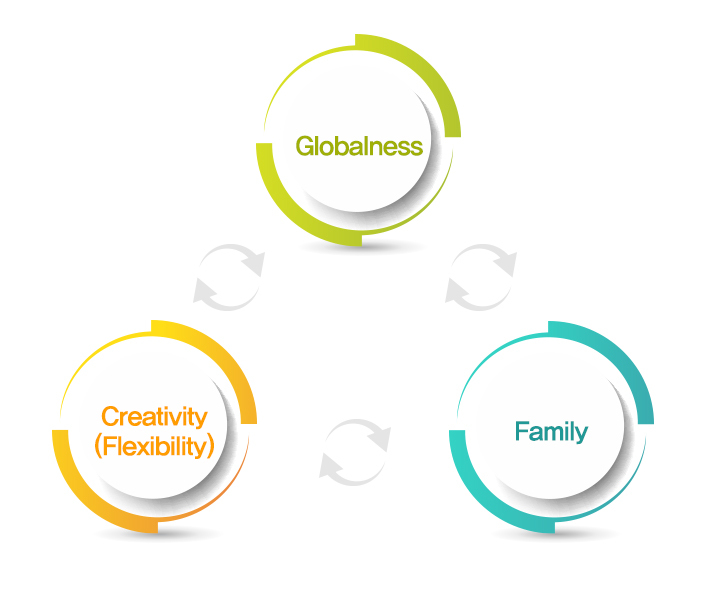 큐로의 Vision "인류의 행복을 추구하는 Creative Global Family" 는 Creativity, Flexibility, Globalness, Family로 구성됩니다. Creativity는 경영이념인 "You think, we create" 에서 출발하는 개념으로 고객을 위한 가치창조를 뛰어 넘어 전인류의 행복을 위한 가치창조를 의미하는 핵심가	치로 큐로그룹 비전의 가장 중요한 가치입니다. Flexibility는 Creativity에서 파생된 개념으로 시시각각으로 변하는 환경변화에 전략적으로 대응하기 위한 핵심가치입니다. 큐로의 Flexibility는 생존을 위협할수 있는 경제위기를 극복하기 위한 유연한 시스템을 추구합니다. 큐로는 일찍이 대한민국 시장의 협소함을 인지하고 이를 극복하기 위하여 세계시장을 겨냥해 왔습니다. 현재 진행되고 있는 바이오사업 및 전기자동차사업 뿐만 아니라 패션, 솔루션, 엔터테인먼트, 커피관련 사업도 이러한 Globalness에 입각하여 세계시장을 궁극적인 목표로 하고 있으며, 인적·물적 자원도 경쟁력 있게 조달할 수 있는 국제적인 Network도 추구하고 있습니다. Family는 큐로가 수익성만을 갈구하는 기업의 본성을 뛰어 넘어 큐로그룹 임직원 각자가 큐로그룹의 성장 안에서 자신의 능력을 계발하여 발전을 이루어 가는 공동체 개념임을 강조하고 있습니다. 큐로의 임직원은 위에서 설명한 핵심가치를 실천하여 미래비전을 향해 나아갈 것을 약속드립니다. Since its beginning in January of 2004, CURO Group has pursued a new value on the ground of our philosophy, "You think. We create". CURO Group has successfully rooted in various business areas under the CURO vision, "Creative Global Family, bringing happiness to the humanity". These business missions include fashion & apparel, IT solution, coffee and F&B. Moreover, CURO Group has extended its business sphere further into entertainment business including movie, drama, management, and game and electronic automobile as well as a bio pharmaceutical technology with developing HIV/AIDS vaccine for the first time in human history. CURO vision, "Create Global Family, bringing happiness to the humanity" is composed of three key words : "Creativity (Flexibility)", "Globalness", and "Family"
"Creativity" is a concept started from our philosophy "You think. We create. ", and it is at the very core of our CURO vision, bringing out a happiness to the humanity. "Flexibility", is a side stepped value from "creativity", and it has come up as another face of "creativity", strategically corresponding to the rapidly changing business environment. "Globalness" is to demonstrate CURO's effort to excel in the global market and overcome the geographical and physical limit. Every CURO businesses, such as fashion & apparel, IT solution and semi-conductor equipment, as well as bio tech and energy, are aiming to advance into more of global markets. Furthermore, we are quickly building up our business network to procure critical business resources, such as human forces, on the global basis. For the last, CURO Group, beyond its profit seeking business nature, tries to realize the concept of "Family" for every employee, in such a way that all employees could develop their own potentials and expertise while contributing to the growth of CURO Group, as a "Family". We, CURO Group, will continuously move forward to the bright future with robustly carrying out our promises and core values.